To get to know pearls, you have to understand the creatures that grow them – oysters and mussels. Learning about gemstones such as diamonds and rubies or precious metals are a matter of geology and chemistry whereas pearls are a product of living creatures and so are more a study of Biology. Pearls are naturally grown by shelled creatures called molluscs that live in saltwater seas and oceans or freshwater lakes and rivers all over the world. Some oysters and mussels (which are both types of mollusc) have naturally shiny and colourful shells. This is amazing in itself because the hard shells of these animals are designed to protect them from being eaten by other creatures, not to look pretty. Beauty in nature tends to serve a purpose – flowers attract insects, tigers hide in the jungle but these molluscs live at the bottom of seas and lakes where it’s dark and muddy, they have no evolutionary benefit from being shiny, it’s just one of those wonderful coincidences and it’s because of this coincidence that we get pearls. Which will start to become clear as you read on. The reason that pearls are created is that when foreign things, such as small bits of seaweed or tiny crabs get stuck in a mollusc, the mollusc will defend itself by covering the intruding object with the same material with which it makes its shell. When something intrudes the human body, we get a spot or a temperature. Molluscs on the other hand protect themselves by wrapping the intruder with their shell which, some of the time, can be beautifully shiny resulting in a pearl. There are about 85,000 known types of mollusc (which includes snails, slugs and squids amongst others) but only 20 of these have the shiny shells needed to make pearls. It is these 20 remarkable, shiny shelled creatures which make pearls. Their shiny shells are made out of an iridescent material called nacre (pronounced nay-ker), which is the same material that forms pearls. Molluscs which don’t have shiny shells, like the mussels we eat in moules marinières for example, can also cover intruders with their shell, but as it isn’t shiny, the resulting ‘pearls’ aren‘t very attractive, (and they can break your teeth if you’re not careful…). So in summary, small organic particles sometimes get lodged in molluscs in the wild across the world. They then cover these intrusions with the same material that they use to make their shells. In the certain species of mollusc that have randomly developed shiny shells these intruders wrapped objects are also shiny, and called a pearl. This has been happening for millions of years, it was only about one hundred years ago that we learned how to kick start this process and so let more people benefit from these wonderful gems from nature. Diamonds have the 4 Cs but unfortunately pearls can be a little more complicated. Their value is affected by size, shape, colour, lustre, surface quality, nacre thickness and matching. The values of gems can vary enormously, and pearls are no exception. Some strings of pearls cost £35, and others can be worth £5 million pounds. In this section we’ll show you what to look for so that you can choose the pearls with the right characteristics for you. The Gemmological Institute of America (GIA) are widely recognised as the world’s foremost authority on pearls and it’s their Pearl Grading System that we use. In our view it’s the most thorough and takes into account all the different factors that affect the quality and therefore value of a pearl. Here’s an explanation of the GIA’s 7 factors that determine the value of a pearl. All else being equal, the bigger the pearl, the more valuable it will be. It’s a rule of thumb that you can apply to all gems and the size of a pearl will have a huge impact on its value. Having said that, there’s more to it than just the bigger it is, the more it costs. Different pearl types are born in different sizes, and so the effect that size has on the price is dependent on what pearl type it is. For example, 6mm is a fairly common size of Freshwater pearls, and so is 7mm (we measure pearls by their diameter). Therefore, the difference in price between a 6mm Freshwater pearl and 7mm Freshwater pearl isn’t very big. Whereas the difference between a 12mm and 13mm string of Freshwater pearls is more than double. This is because, when you start reaching the upper limits of a pearl type’s size, the value starts increasing more quickly. This can also be seen when comparing other pearl types, for example, all else being equal, a 10mm string of Akoya pearls would generally cost more than a 12mm string of South Sea pearls. This is because it’s very rare for an Akoya pearl to reach 10mm in diameter, whereas a South Sea pearl is generally bigger than 12mm. Only a small percentage of the biggest, healthiest molluscs can produce the larger pearls which makes them rare. As with all pearl grading factors, rarity increases their desirability which in turn increases their value. Lustre is the name given to the shininess of a pearl, the shinier it is, the better its lustre. But there’s a difference between a pearl’s shine and that of a mirror or a synthetic bead. When a pearl has great lustre, light travels through its layers of nacre and is refracted and reflected from within, giving the pearl an amazing inner glow that is quite incredible, and can only be seen when looking at the real thing. We place a lot of value on lustre, because it really doesn’t matter if a pearl is big or small, round or baroque, if it has great lustre, it will make beautiful jewellery. The GIA, classify lustre in four levels which are Poor, Fair, Good and Excellent. There are two main factors which influence the lustre of a pearl during its growth, the first is temperature. When it’s warm the mollusc will lay relatively thick, spongy layers of nacre, which grow the pearl quickly but if left on the surface will result in poor lustre. When it’s cold the nacre is layered more densely and it’s the dense nacre layers that give good lustre. When it’s cold, the pearl won’t grow as quickly, but if it’s harvested after a cold spell then it will have better lustre. The second factor which affects the lustre of a pearl is the health of the mollusc that grows it, only healthy oysters and mussels make pearls with good lustre. If there’s any pollution in the water, then the lustre is one of the first things to go. This is the main reason why pearl farmers make such a big effort to look after the environment surrounding their pearl farms. Lustre has a huge impact on value, for example, even if a great big pearl that’s 15mm in diameter has poor lustre then it will be almost worthless. Shape has a big impact on the value of a pearl, the rounder a pearl, the more expensive it is. As with a lot of value factors we like to think that being more expensive doesn’t necessarily make them better but rather different pearl shapes offer different looks. Round pearls give their owner a fabulous look, there’s no doubt about that, but so do oval pearls, drop shaped pearls, baroque pearls and button shaped pearls. It all depends on the style that you’re going for. However, if the design of your desires features perfectly round pearls, we’re afraid that you’ll have to spend a bit more money on them. But why? Not everyone prefers their pearls to be perfectly round, so why are they more expensive? There are two main reasons; the first goes back to the origin of the pearl market, which has historically been centred in Japan. Japanese culture has strongly influenced the world of pearls, and Japanese style traditionally gravitates towards purist perfection, hence the established desirability of round pearls. The second is that round pearls are rarer and as with all precious stones, the rarer they are, the more expensive they are. When it comes to what to call the shapes of pearls, our general rule of thumb is to say what you see, apart from a couple of specific terms such as baroque and keshi. Perfectly round Freshwater pearls are very rare because most Freshwater pearls are nucleated with a tiny piece of soft tissue rather than a bead. This means the mussel that grows them has no scaffolding on which to lay the nacre, making them far less likely to be perfectly round than a saltwater pearl which is nucleated with a big, round bead. Near Round is the term we use to describe the shape of a pearl that looks round when worn but, under close inspection, isn’t actually perfectly round. We use Near Round pearls in a lot of our jewellery because they give the same look as a round pearl, but are much cheaper, often less than half the price of the equivalent, perfectly round pearl. Baroque pearls each have a unique, random and irregular shape. They have a one of a kind appeal to them and the way the light reflects off their many edges and angles gives them a stunning, sparkly look. They’re the most affordable pearl shape which works well for those who appreciate their interesting shapes and lustrous edges. ‘Keshi’ was the term given to small, very baroque (i.e. irregular shaped) natural pearls found by the original Japanese pearl divers hundreds of years ago, before the invention of cultured pearls. Keshi is the Japanese word for ‘poppy seed’ and it’s an apt name because when you look closely at poppy seeds they’re obviously small but also very irregular in shape. However, when saltwater pearl farmers began to farm pearls these small Keshi pearls continued to spring up. You can imagine their surprise, they nucleated the oyster with a big bead but when they opened it up the resulting pearl was smaller and often flatter than the original bead that they had put in it two years earlier. Oysters normally layer nacre on top of the nucleating bead and so how could these tiny pearls be formed as a result of their nucleation? Debate has raged across the pearl world as to what causes these keshi pearls, are they natural pearls that have formed completely independently? Or maybe a bit of dust fell into the shell, when they opened it up to nucleate it which triggered the formation of a pearl? We believe the most likely explanation is that the small piece of tissue which is inserted along with the bead to nucleate saltwater pearls will have started to form a pearl sac, but then bead will have been released by the oyster. Then, the pearl sac will have stayed in the oyster and continued to layer nacre within it but as there’s no bead to act as scaffolding a small, keshi pearl will be formed. Beads are often ejected from the oyster, particularly if the bead was too big for it, but normally the pearl sac goes with it. The pearl industry has often described keshi pearls as half way between a natural and cultured pearl, and so charged a premium for them. In fact, they’re more like a lucky accident of the pearl farming process. They’re always 100% nacre and so very lustrous and formed in weird and wonderful shapes which can make beautiful jewellery. 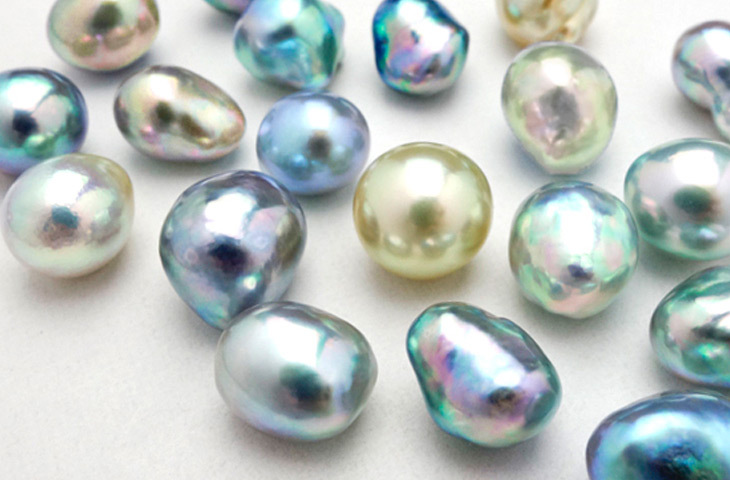 So why do we call some pearls ‘keshi shaped’? Just to make it a bit more complicated, we call Freshwater pearls keshi shaped because they’re not nucleated with a bead in the first place, so they’re not a happy accident of the pearl growing process. The reason they form into a keshi shape, is that they will have grown near the mussel’s muscle, and so each time the mussel opens and closes (which they do all day long) the pearl sac will be squashed into random shapes creating a keshi shaped Freshwater pearl. 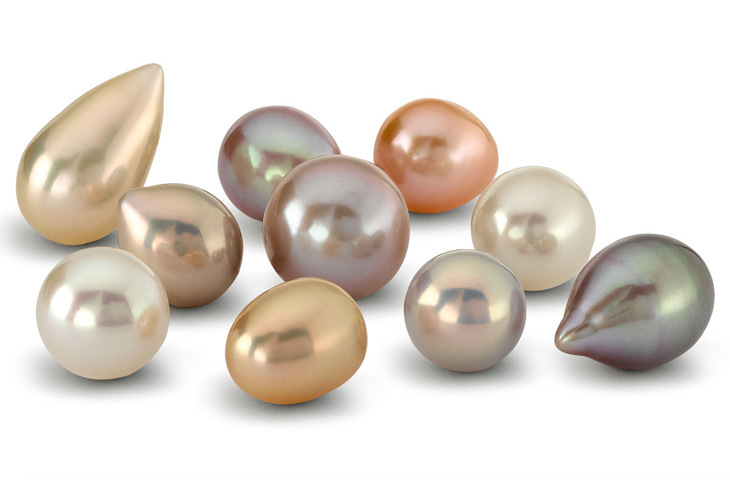 Colour plays a huge role in your choice of pearl, but thankfully, it doesn’t have a big effect on the value of a pearl. For example, white, peach and purple Freshwater pearls of the same lustre, size, shape and surface quality will all cost the same. If a certain colour is rare then that can temporarily bring the price up, but the other grading factors do influence value more than colour. As with shape, colour is generally described as you see it, but when describing the colour of a pearl you need to look for more than one. The way in which light reflects and refracts through layers of nacre gives good quality pearls an overtone as well as a body-colour. For example, white Akoya pearls often have a pink or green overtone, purple Freshwater pearls can have a bronze overtone and Tahitian pearls can have all sorts of different overtones. These layers of colour are what make pearls both fascinating and beautiful, some of them are very subtle and hard to spot at first, but when you do see them it’s a real treat. Sometimes a third layer of colour can be seen on the very best quality pearls. The phenomenon is called orient, and it occurs when the nacre is so thick and dense that light splits as it passes through it, creating an incredible rainbow effect. It’s a bit like the shimmer you see on the surface of a bubble or the colours inside a diamond. Orient is only exhibited on pearls with the very best quality lustre. This is an important one, surface quality refers to the finish on the surface of a pearl. Only a small percentage of pearls have a totally smooth, even surface, the majority are marked with pits or bands or bumps or even cracks. 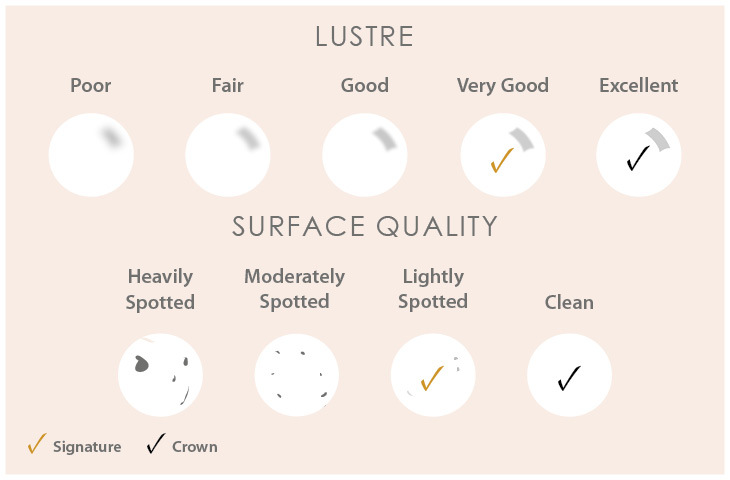 Surface quality isn’t to be confused with lustre or shape, and the effect on the value of the pearls that surface quality has is dependent on the visual impact of the blemish. For example, if a pearl is perfect, other than an infinitesimal pit, it will only lose a small percentage of its value, but if it has a big brown lump, that can’t de disguised by its setting, then it will lose nearly all of its value. We guarantee that all the pearls in our jewellery will be completely absent of what we call unsightly blemishes. Our pearls will occasionally be marked but only to a degree that doesn’t impact on the beauty of the piece. Sometimes we use pearls specifically for their imperfect surface as they can add character, highlight their natural beginnings and emphasise the individuality of the pearls. You‘ll be pleased to hear that by the time you’ve evaluated the size, lustre, shape, colour and surface quality of your pearls, you’ll be pretty much there. Nacre thickness is only relevant for bead nucleated pearls, i.e. saltwater and certain Freshwater pearls because the majority of Freshwater pearls are 100% nacre and have no bead in the middle. If the nacre is too thin then you can see the bead in the middle of the pearl, it appears as a dull, dark patch which is most evident when the pearl is rolled on a light grey background. It appears that the pearl is blinking at you as the thin patch reveals the bead underneath. The dark patch is a problem in itself, but it also hinders the lustre of the pearl, and will be more likely to chip, or peel, especially where it’s drilled. For Akoya pearls, a nacre thickness of under 0.25 millimetres is considered too thin, and above 0.5mm very thick, 0.3mm should be just fine. Tahitian pearls need thicker nacre of at least 0.8mm and it should really be more than 1mm thick. The minimum thickness of South Sea pearls is generally considered to be 1mm and can be as generous as 5mm thick. Matching is a reflection on the whole piece, rather than the individual pearls. It’s an assessment on how well matched the pearls are for the other value factors. For example, if a string of intentionally matched pearls had one, slightly smaller pearl, that pearl will reduce the value of the whole string and so it would be worth replacing it. Natural and Cultured pearls are both real pearls, grown by the same animals. The difference is that pearl farmers have initiated the process of forming a Cultured Pearl, whereas Natural Pearls started growing by chance in the wild. 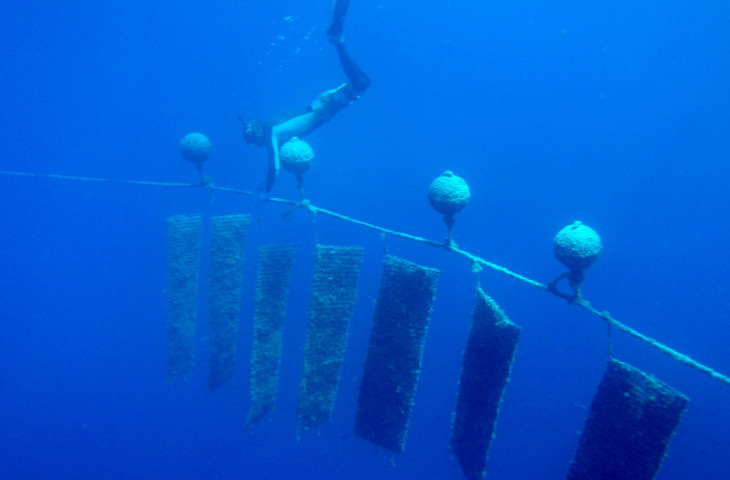 Here’s a look at how we started farming pearls. Pearls are our oldest known gem. Records have been found showing that Egyptians wore mother of pearl jewellery over 5,000 years ago and there’s a text written in China describing a pearl that’s more than 4,500 years old. However, until about one hundred years ago we only had natural pearls because no-one knew how to recreate the miracle that is the birth of a pearl. 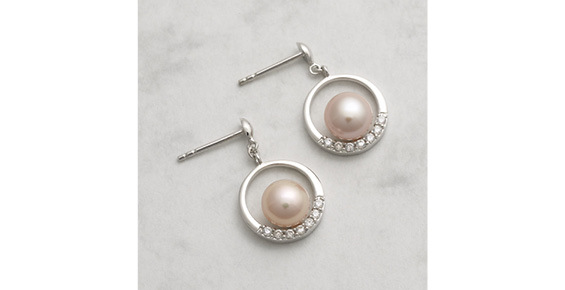 For literally thousands of years, pearls have been loved and cherished for their beauty and their mystery. They were so rare that they were incredibly expensive and so could only be enjoyed by a very small group of lucky people, i.e. royalty. Pearls were so rare because we didn’t know how to farm them and only one in a thousand oysters found in the wild would contain a pearl of gem quality. Therefore, it would take around 50,000 oysters to make a necklace. Before the 1890s, when we learned how to grow pearls, all pearls were what we now call natural, which means that they were found in an oyster picked from the wild. Natural pearls are those that are formed when an intruder (such as a bit of coral for example) randomly gets stuck in a mollusc. For centuries many of the world’s cleverest scientists had been trying to kick start the pearl growing process. The father of Taxonomy, Carl Linnaeus, came close in the 1700s but it was only until a century later that we learned the technique that’s still used to this day to grow pearls. By the late 1800s pearl growing oysters and mussels were running out. Nacreous (i.e. shiny) oysters and mussels have always been picked for their pearls as well as their Mother of Pearl shells which are traditionally used in jewellery, furniture inlay, fine cutlery and most commonly to make buttons (which is why to this day, plastic shirt buttons are given a pearly look). The industrial revolution brought about machines, helping us get better at picking the oysters that significantly reduced the size of the world’s natural oyster beds. Oil wells also began popping up at about this time which inevitably leaked, resulting in oil wiping out enormous, ancient oyster beds in many seas around the Middle East. So with the pollution and advanced diving techniques our heroic pearl growing oysters were soon to become a thing of the past. Until, that is, we learned how to farm them creating what is known as a Cultured Pearl. Cultured pearls are those that are formed when an intruder (such as a mother of pearl bead) is placed into a mollusc, i.e. an oyster or mussel, by a person. That is the technical difference between natural and cultured pearls, and as they’re made by molluscs, we call them real pearls. A number of people contributed to the invention of pearl culturing and to them we are eternally grateful. The first cultured pearl was produced by an Englishman in Australia called William Saville-Kent but it was in Japan that this revolutionary development really took hold. A saltwater mollusc was successfully nucleated to produce an Akoya pearl and since then the pearl world has never looked back. 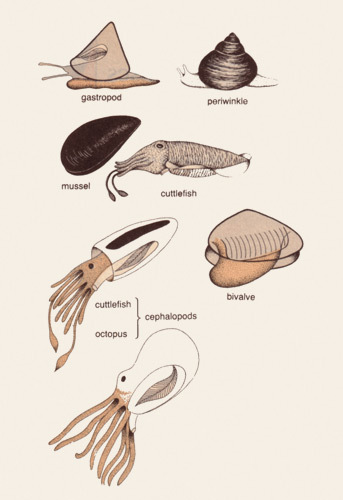 What’s more marine biologists have researched the life cycle of molluscs so we can grow them ourselves rather than having to pick them from the wild allowing these wonderful creatures to thrive. Natural pearl diving is now banned or at least strictly controlled in pretty much every country in the world, from Scotland to Australia. This is to protect the incredibly valuable oyster beds. As a result of this, natural pearls have become extremely rare and are now only really traded as antiques. They demand huge price tags and are sold in auction houses rather than jewellers. The Baroda string of natural, Akoya pearls was sold in auction for $7.1 million dollars in 2005, a string of the same quality, cultured Akoya pearls would retail for around £20,000. The vast majority of pearls worn today are cultured pearls. After over one hundred years of pearl farming we’ve become better and better at growing good quality pearls, particularly by selectively breeding the oysters and mussels that create the best pearls. This means that we’re in the lucky position of being able to grow much better quality cultured pearls at a tiny fraction of the price that would have had to be paid for their natural equivalents. Each species of plant grows different flowers, in a similar way different species of mollusc grow different pearls. This variation gives a huge choice of size, colour, shape, shine and price to choose from. There are different types of oysters and mussels and each produces a different type of pearl with its own characteristics dependent upon those of the mollusc. For example, the larger molluscs produce larger pearls and oysters with blue shells produce blue pearls. Of the 50,000 types of mollusc in the world, only four are used to farm pearls, producing the four major pearl types – Akoya, South Sea and Tahitian pearls which grow in the sea and Freshwater pearls that grown in lakes and rivers. 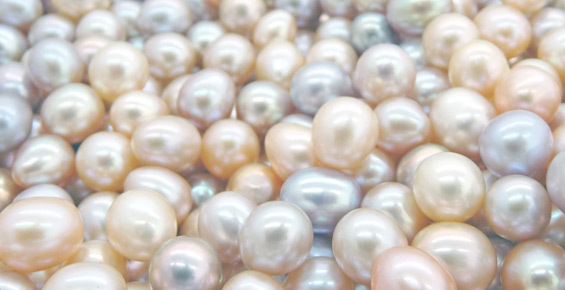 Each pearl type varies in a number of characteristics from size and colour, to lustre, shape and culturing method. Here’s more information on each pearl type. Natural Freshwater pearls have been around for thousands of years but cultured Freshwater pearls only came onto the market in the 1970s. The first Freshwater cultured pearls were small, rice shaped, baroque pearls with poor lustre. But within just 20 years our farmers began to offer rounder, more lustrous Freshwater pearls and they’ve continued to get better and better ever since. They’re now so good that they’re on a par with their saltwater cousins. Rather than growing in the sea like the other pearl types, Freshwater mussels grow in lakes, rivers, ponds and reservoirs, hence their name. They’re borne in a range of white, peach, pink and purple colours and have a lovely, soft lustre that’s often described as giving them an inner glow. One of the best things about Freshwater pearls is their price. Freshwater pearls are so much easier to grow than Saltwater pearls and are therefore much more affordable. Each Freshwater mussel can grow up to 40 pearls at a time and farmers can expect at least a 95% yield from the mussels they nucleate. Whereas you can rarely get more than two pearls from saltwater oysters and a farmer is lucky if they get a yield of 15%. This means that from 100 nucleated Freshwater mussels, a farmer can expect 3,000 to 4,000 pearls. But from 100 saltwater oysters a farmer would be lucky to yield 30 pearls. Which is a massive difference! This, accompanied by the fact for the three years or so that they’re growing the pearls, Freshwater mussels need a lot less looking after than saltwater oysters which also adds to their affordability. Another big difference between Freshwater and Saltwater pearls is the way they’re nucleated, i.e. the way we start off the pearl growing process. To nucleate a saltwater pearl the farmer will implant a bead, and a small square of soft tissue from a donor oyster. This soft tissue then grows around the bead and lays nacre onto it, forming a pearl. Whereas a Freshwater pearl farmer only introduces the soft tissue, there’s no need for a bead with Freshwater pearls. This means that a Freshwater pearl is 100% nacre, all the way through the pearl, whereas the layer of nacre in a saltwater pearl will generally account for around 5% of the pearl. A good sized Freshwater pearl is about 7mm in diameter, but they can be farmed in sizes from as small as 1mm all the way up to 12mm on a regular basis. We’ve even seen Freshwater pearls over 21mm, but they’re rare. Freshwater pearls are farmed in some African countries and India as well as the Mississippi and Japan to a very small degree but the majority and the best quality Freshwater pearls are grown in South Eastern China, which is where we source ours. 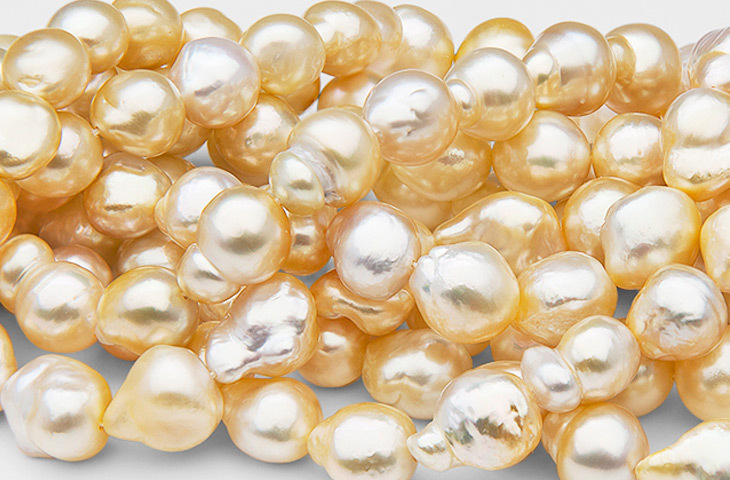 Akoya pearls are the original cultured pearl, when we imagine pearls the first thing that springs to mind tends to be a string of beautiful, shiny, white, small, round gems, which is a fair description of Akoya pearls. 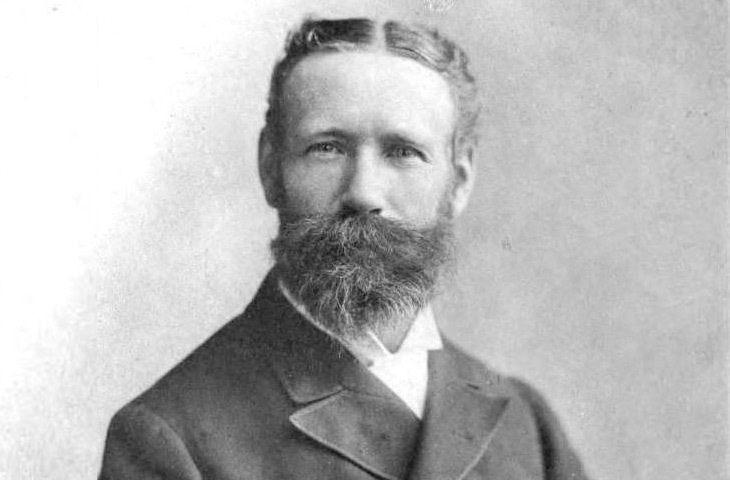 The method we use for culturing pearls today was invented by a Englishman, called William Saville-Kent, in Australia at the end of the 19th century but it was in Japan at the beginning of the 20th century that the first pearl farms began to produce commercial quantities of pearls. The native pearl growing oyster to Japan is the saltwater Pinctada fucata which produces Akoya pearls and so when the cultured pearl revolution took off it was with Akoya pearls. As with each pearl type, Akoya pearls have their own characteristics by which you can identify them and for which they’re special. 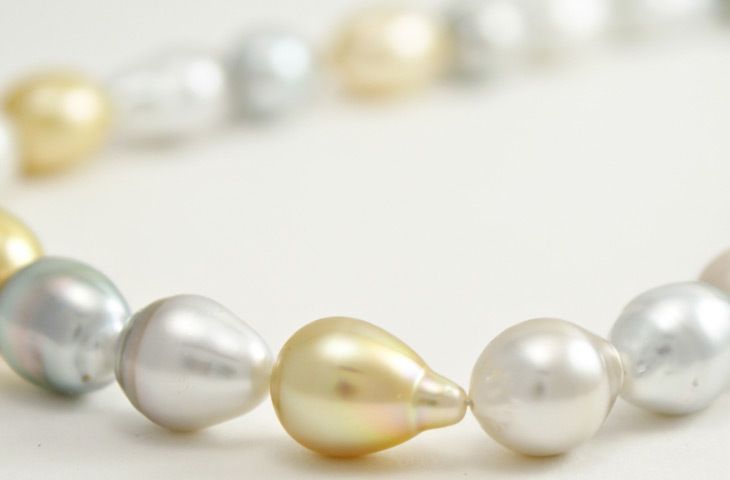 Firstly, Akoya pearls are born in a beautiful array of white, blue, grey and yellow hues. We think that the Akoya’s most distinctive feature is that they have the most mirror-like lustre, Freshwater pearls have a soft glow, South Sea pearls, a satin-like lustre but Akoyas tend to have the most brilliant shine. Akoya pearls are the most frequently round of all pearl types and all else being equal, the rounder a pearl, the more expensive it will be. They’re grown by relatively small oysters and so are rarely bigger than 9mm but because they’re bead nucleated, they’re generally bigger than 4mm in diameter. Tahitian pearls are just wonderful; they shine in the most incredible combination of colours from peacock to pistachio, green to silver, orange, blue, yellow and everything in between. They grow in the huge black lipped oyster that you can see above. They can be about a foot (30cm) across, which allows us to grow great big Tahitian pearls. The smallest Tahitian pearls you’ll find are 7mm in diameter and they can be found over 20mm but the average is about 10mm. 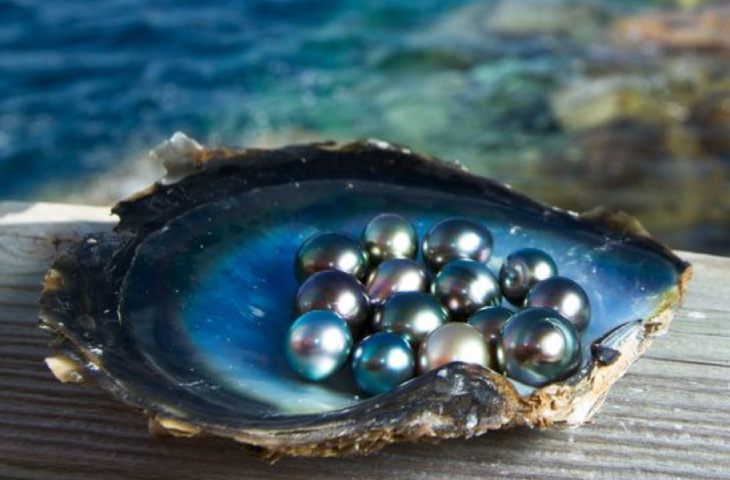 The Tahitian pearl oyster, Pinctada margaritifera, is native to French Polynesia, the capital of which is Tahiti but Tahitian pearls are also farmed in Indonesia, South East Asian countries such as Thailand and Burma and even Fiji. Whilst they’re called Tahitian, it doesn’t necessarily mean that they were grown off the coast of Tahiti. Cultured Tahitian pearls first came onto the market in the mid 1970’s, so they’re our newest pearl. The industry had been so used to seeing the light colours of Akoya pearls and so no one believed that these huge, dark coloured pearls were natural colour. 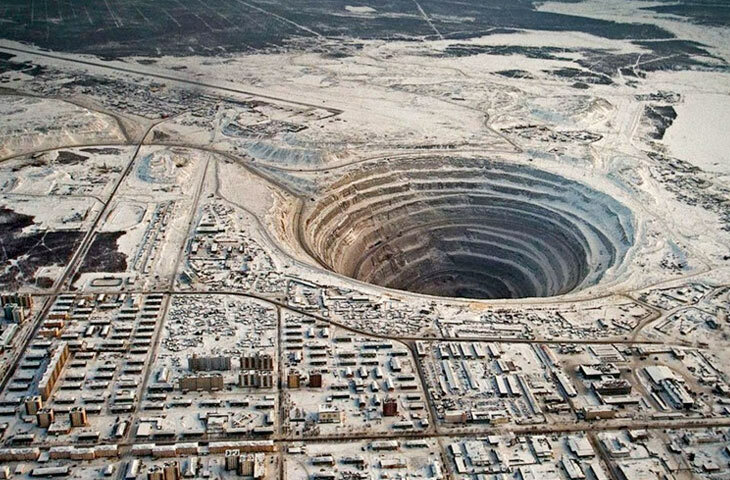 It was only when they were tested by the GIA’s gem labs that the jewellery trade accepted them as the real deal, and the rest as they say is history. Last but by no means least on our list of pearl types, is the South Sea pearl. South Sea pearls are the biggest of all pearl types. They’re produced by the giant Pinctada Maxima which is the largest of all pearl growing oysters, they regularly grow to more than a foot across, sometimes as big as 35cm in diameter. This large size allows the farmers to nucleate the oyster with a big bead which helps them to yield massive pearls. The Pinctada Maxima is also capable of layering nacre more thickly and more quickly than other pearl types which contributes to their ability to produce such beautiful, big pearls. There are two varieties of Pinctada Maxima, the silver lipped and gold lipped oyster. They’re both the same species but produce different coloured pearls. The silver lipped oysters produce beautiful, subtle whites, creams, greys and blue colours whereas the gold-lipped variety produces more of the incredible golden South Sea pearls. Another distinguishing feature of these pearls is their soft, satin-like lustre. The shine isn’t as mirror-like as in Akoya pearls but it’s just as beautiful. Their incredible size, colour and lustre mean that South Sea Pearls are the most expensive type of pearl to buy. With some strings fetching many tens of thousands of pounds. Commercial South Sea pearl farming began in North Western Australia in the 1940s, and Australia is still seen by many as the home of South Sea Pearls, but you can also find many fabulous South Sea pearl farms in the Philippines and Indonesia. The farms themselves go from simple, small businesses to large, complex organisations that use big cruisers as floating nucleation laboratories and sea planes to transport the valuable oysters. But no matter the size of the business, they all make huge efforts to protect the environment around their pearl farms which in turn protects the oysters, allowing them to stay healthy and produce beautiful pearls. The wonderful side effect of this is that the farms themselves become areas of outstanding natural beauty where wildlife that is under threat elsewhere, can thrive. One of the great things about pearls is that they’re so diverse, they vary in terms of size, colour, design, quality and price so much so, that no matter what your taste or budget, you’ll be able to find the perfect pearl jewellery for you. We don’t like to think that any pearl type is better than another but simply that each is fabulous in its own right. We hope that understanding the different types of pearl that are available to you will help you choose your perfect pearl jewellery. And, very importantly, that you’ll be able to cherish your pearls all the more because you’ll know why they’re special. Pearls can last for generations, but only if they’re looked after properly. Compared to other gems they’re relatively soft and so can be irreparably damaged without proper care. In this section we will go through maintenance tips, storing in the right manner, cleaning your pearls and restringing. Following this guide will ensure that your pearls stay beautiful year after year. Pearls are surprisingly absorbent and need to maintain a certain level of moisture in order to retain their bright colour and lustre. One of the best ways to do this is simply to wear them. They absorb natural oils from the skin, which tops up their moisture levels. Otherwise they turn a dull, yellowy brown and lose their lustre. Perfume and hairspray: these both contain relatively powerful solvents that dissolve nacre. Cleaning products: we recommend strongly against wearing pearls whilst using a household cleaning product. Other beauty products; the best thing to do is apply your make-up and perfume, wait a couple of minutes and then put your pearls on. Finally, we advise caution when wearing pearl rings. We glue our pearls onto a relatively thick metal post, but a sharp blow or simply wearing gloves over the pearl (gardening seems to present a dangerous combination of these circumstances…) can break the post or knock the pearl off. We thoroughly recommend that pearls are kept in a soft cloth, such as the Isle of Wight Pearl pouches, to prevent scratches. Jewellery boxes contain a lot of sharp edges that can easily damage your pearls. 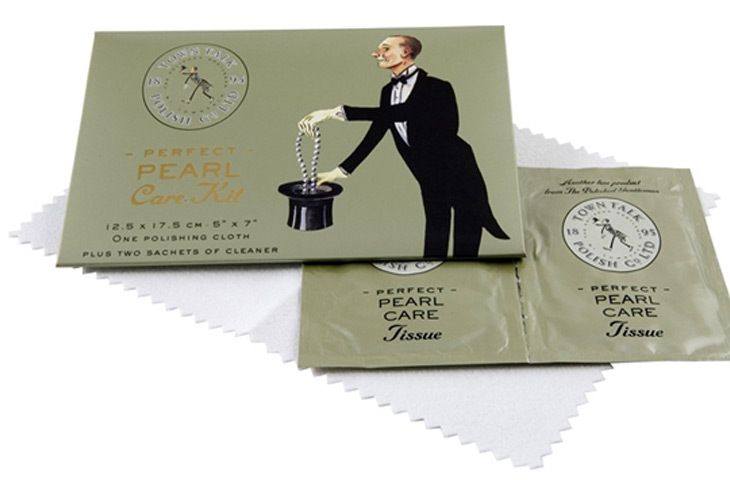 Whilst we have found that a very low concentration of mild soapy water is an effective, safe way of cleaning pearls, others say that they must be cleaned using special cleaning kits, such as those supplied by ‘Town Talk Polish Co. Ltd’. We explain the pros and cons of each (cost vs risk) to our customers and let them decide, with the cost of their pearls often influencing their decision. Our string of pearls are individually knotted using two strands of silk thread. The knots prevent the pearls from rubbing together and make sure that only one pearl would be lost if the strand breaks. The advantage of silk is that the knots relax as they’re warmed when worn giving a nice supple string, and then re-tighten naturally when they’re put away. However, depending on how often they’re worn and the size of the pearls the knots will eventually stretch and/or become discoloured. This isn’t a big problem as pearls can be re-string relatively affordably. We can restring your Isle of Wight Pearl strings for free the first time, please simply follow the returns procedure here and we’ll get this organised. Oysters are referred to as the ‘canaries of the ocean’ because like the birds that detected gas in mines from years gone by, oysters are the first to suffer when their water isn’t as it should be. Pearl growing oysters are ancient creatures that are very sensitive to their environment. Pearl farmers therefore go to great lengths to keep the water around their oysters clean by preventing pollution, cyanide fishing and dynamite fishing in their local areas. 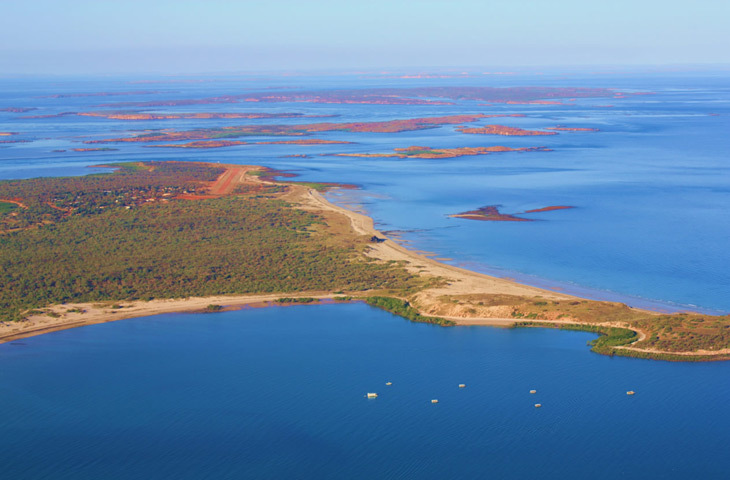 This creates rare areas of incredible natural beauty and biodiversity around pearl farms. Whilst pearl farming is wonderful for the environment, it’s under threat from climate change. We therefore promote this important message by doing our bit to help, offsetting the carbon footprint of our jewellery and packaging through the funding of green energy projects. In partnership with the CarbonNeutral Company we recently helped support the development of a new hydroelectric facility in South Eastern China, providing cheap, clean energy to the developing areas near to where our Freshwater pearls are grown.